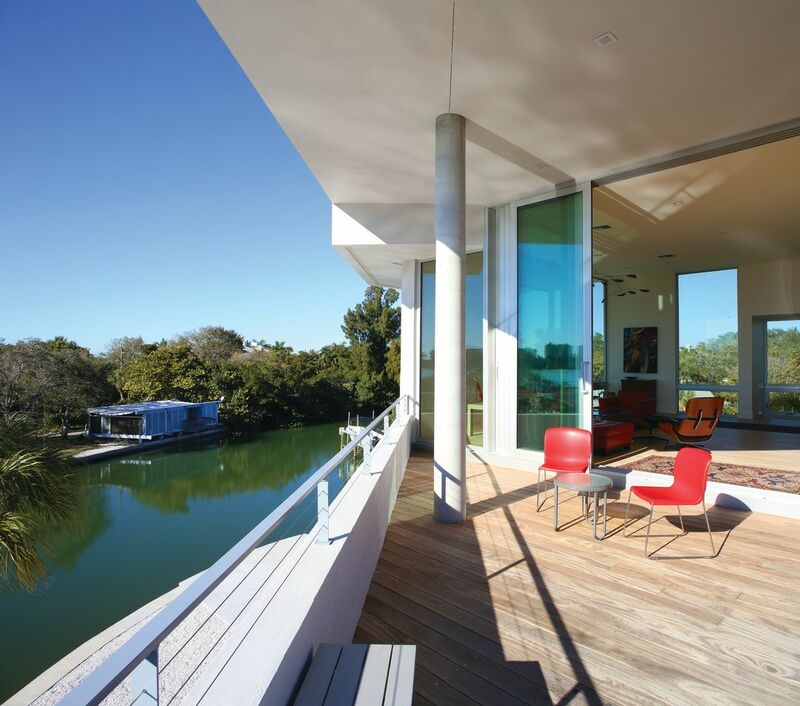 Sarasota School of Architecture enthusiasts have one more reason to look to north Siesta Key’s Bayou Louise neighborhood as a hotbed of modern architecture. A new addition to the neighborhood has just joined some august architectural company. 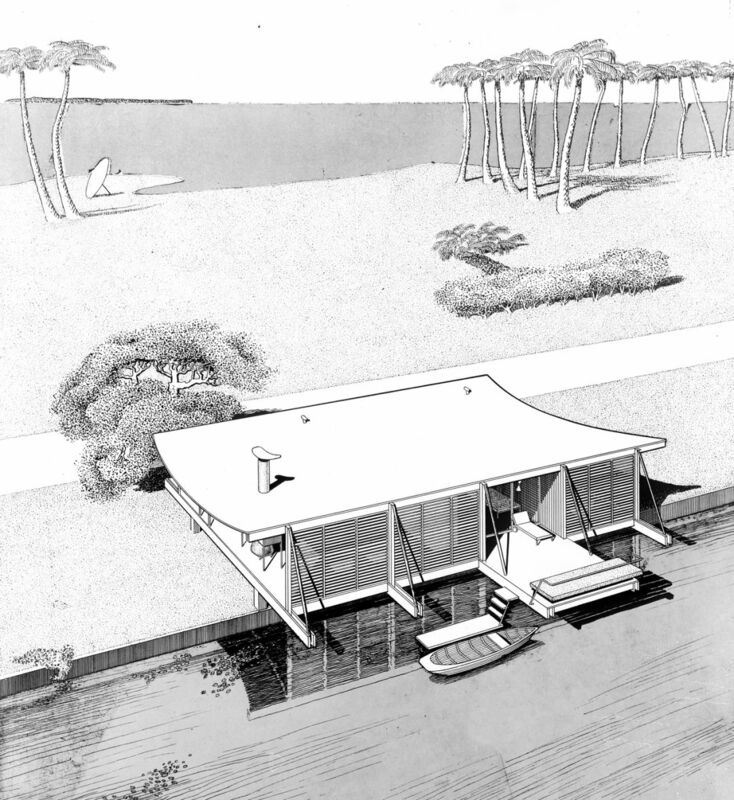 Separated by a narrow shell road from Paul Rudolph and Ralph Twitchell’s iconic 1949 Revere Quality House, right across narrow Bayou Louise from the pair’s revolutionary 1950 Healy Guest House, a.k.a. the Cocoon House; and two blocks north of Rudolph’s classic 1955 Cohen House, architect Carl Abbott recently completed his newest residential project. 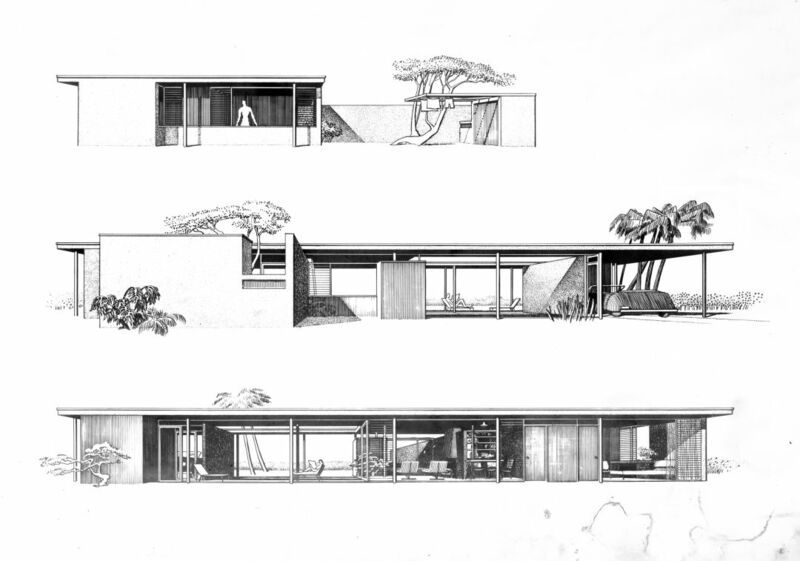 The Butterfield House is a multigenerational home with an emphasis on outdoor living, designed by Abbott—an original Sarasota School of Architecture member and former student of Paul Rudolph—in collaboration with his former associate, architect Leonardo Lunardi. Abbott was in charge of the design, while Lunardi provided building code research, specs and managing and organizing the project. “It was designed to be a fun house, and that’s what it is,” says Abbott. The owners, John Butterfield, who celebrated his 90th birthday in January, and his daughter, Leslie Butterfield, and son-in-law, Steve Sadoskas, recent transplants from Houston, plan to spend every spare moment enjoying the outdoor setting. They charged Abbott with designing large expanses of covered terraces where they can dine, relax and launch water adventures, as they are avid kayakers. The largest space is a ground-level “outdoor room,” as the architect calls it, with a lofty 20-foot ceiling, attached to a three-car garage plus a generous storage room for their kayaks and for a future kiln for Leslie Butterfield, who has a Ph.D. in design from the University of Minnesota and is a painter, potter, weaver and glass artist. “I tell her that architecture is different from painting,” says Abbott. “Architecture is about what’s above you, what’s around you, about the memory of where you’ve been.” And what’s around the Butterfield lot is water, lots of it, on three sides—north, south and west. Abbott cleverly switched the dominant view on every floor in order to project a feeling of movement. “You don’t know quite what happened,” as you climb the stairs from the ground level up, he says. That ground-level outdoor room extends out onto a swimming pool oriented directly toward the Cocoon House. Butterfield senior’s second-floor suite, actually the first living level, has a terrace that overlooks the southwestern portion of Bayou Louise. On the same level are a separate study for Sadoskas—a window over his desk looks out to the Cocoon House—and a painting studio for Leslie Butterfield, with an 11-foot expanse of window that lets in northern light. The third floor is the main living space, with a 24-foot-by-28-foot great room/kitchen combination and terrace with a spectacular 180-degree view of the Gulf of Mexico and Lido Key, all the way up to Plymouth Harbor. 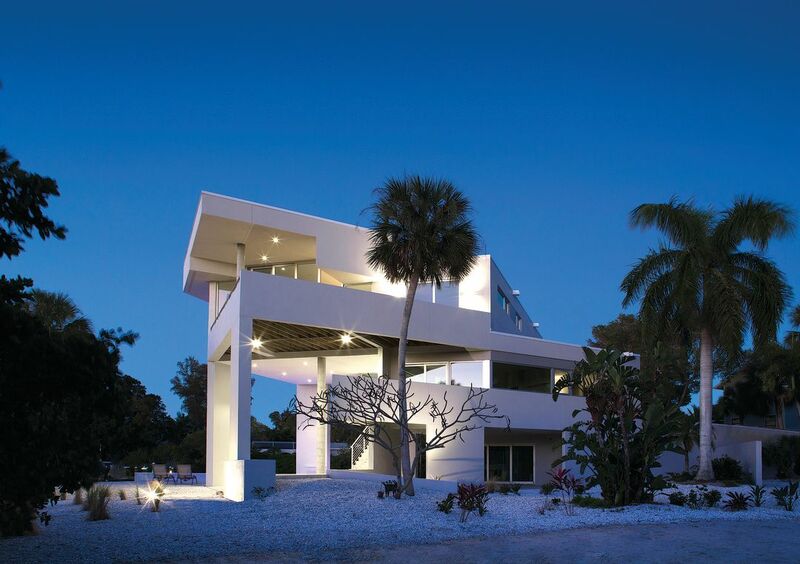 Want to learn more about Sarasota’s standout architecture? Pick up the nifty full-color booklet, Tour Sarasota Architecture, which was produced as a two-hour self-guided driving tour by the Sarasota Architectural Foundation, Visit Sarasota County and the Ringling College of Art and Design. It’s available at the Visit Sarasota County office at 1710 Main St. in downtown Sarasota. Or download a PDF. Even though 65 years separate the Butterfield House from the Healy Guest House right across the bayou, Abbott says he thinks of his new project “as homage to an icon.” Lunardi agrees. 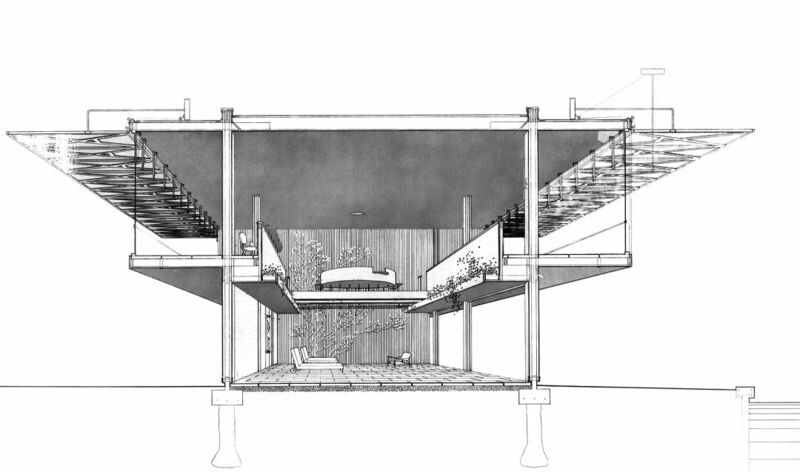 Adjacent to the Butterfield House on Ogden Lane is the 1949 Revere Quality House, a collaboration between Paul Rudolph and his partner, Ralph Twitchell, which gained international attention for its novel use of building materials. It was added to the National Register of Historic Places in 2008, about the same time that architect Guy Peterson restored it and added a three-story addition (not shown here) that adjoins it by way of a glass staircase. Across Bayou Louise, Rudolph and Twitchell designed the Cocoon House, formally known as the Healy Guest House, in 1950 for Twitchell’s in-laws. It was revolutionary for its time, with walls made of wood jalousies that open to let in breezes, and a curved roof that extends out over the bayou. Two blocks to the south, Rudolph’s Cohen House, built in 1955 for former City of Sarasota Mayor David Cohen and his wife, Eleene, is a classic example of the Sarasota School of Architecture, with glass walls that open completely to the elements. Cohen, a violinist, was a co-founder of the then-Florida West Coast Symphony and championed the building of the city-owned Van Wezel Performing Arts Hall; the architects included a conversation pit in the living room where musicians would gather to play chamber music. The home was restored by Sam Holliday of Seibert Architects in 2006.